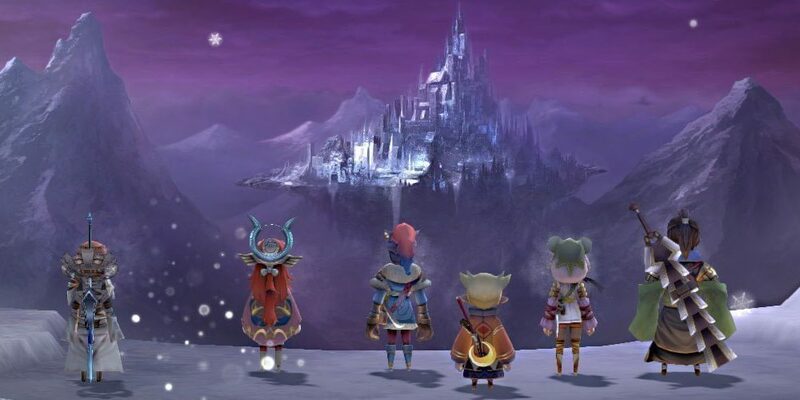 Chrono Trigger's gameplay in a snow-covered world with Final Fantasy X's story and a solo piano soundtrack strongly reminiscent of classic SNES titles. Sure, why not. It speaks somewhat of my preferences that amongst all the video games released recently, the only one I’ve cared enough to play was I Am Setsuna. Took one look at the gameplay and went, “Yep, that’s the one.” Now that I’ve finished it, there’s something to be said for what exactly this game is supposed to be from a business perspective. None of us can tell Square Enix what to do with their intellectual property, and it seems they’ve decided to go Frankenstein and combine some of their old stuff into something new. I Am Setsuna borrows from other titles to the point of almost copy-pasting entire mechanics and plotlines. The combat style is lifted from Chrono Trigger, down to combos and even reusing the same tech names (such as Cyclone and Luminaire). Moreover, the overworld and map traversal are exactly the same. There’s even a section of the game where you go back to all the zones you’ve visited previously to open locked chests containing weapons and items. You’ve even got the time theme as part of the story. And the scythe-wielding Magus joins at the end after being a villain for most of the game. However, the story is taken from Final Fantasy X. You are a mysterious outsider with a five-letter name who ends up as a “guard” (guardian) of the “sacrifice” (summoner) on her “pilgrimage”. I guess they couldn’t think of a different word for that last one. The eponymous sacrifice, Setsuna, is a copy of Yuna. You can just hear her voice actress speak the same irredeemably naive lines. The other characters are stock Final Fantasy archetypes, with Squall from Final Fantasy VIII playing the lead, Endir. Just imagine it in Yuna’s voice. Mechanically, the game does draw some key elements from Final Fantasy X, too. Towards the end of the game, you get an airship, at which point more of the special Spritnite-infected enemies spawn (instead of the dark aeons) and shops sell more items. Not only that, the end of the game involves entering the Last Lands (same as Inside Sin) where you defeat one penultimate boss after which you can still leave (just like defeating Seymour). The final boss of the game is essentially Yu Yevon, who lives inside a barrier, summoning and agitating the monsters of the world. In short, it’s not surprising that this game came from a developer called Tokyo RPG Factory. It’s a prefab game, stitched together from other successful titles and thrown out using the Unity engine. I’d wager it’s a kind of experiment by Square Enix to see what the least amount of necessary effort is required to make a game that turns a profit. That’s not to say I didn’t enjoy the game. For its almost stunning lack of originality, it isn’t without some measure of soul of its own. After all, it borrows elements from two of the best games ever made, and it does it well. For the most part, anyway. There was a point halfway through the game where all challenge drained out of it. Right after the visit to Kir’s village, you encounter three of the Spritnite-infected enemies in a nearby mountain range. They were mean, high-HP rabbits-from-hell-looking things that attacked with a freeze-ray capable of taking out your whole team in one attack. But that didn’t keep me from defeating them using Blowbeat and the fire-charged sword Endir was swinging at the time. Magus, we’ve come to defeat you. Each time these mobs netted me 3000xp, enough to surge through twenty or so levels after a brief stint of grinding. From that point on, every single damn monster encounter died to one combo. And bosses fell to a single Grand Cross. Now, this is definitely my own fault for not moving on after one kill, but after decades of playing this kind of game, it’s been ingrained in me that the game will expect me to level up more than would happen naturally from just playing the story. So, instead of fully exploring the late-game extra content, I just went back to open the boxes and then headed straight for the final boss. I Am Setsuna is not interesting enough to warrant the fifty-or-so hours it takes to truly complete a Final Fantasy-esque game. For me, the most interesting aspect of I Am Setsuna is the music. Not because it’s terrific, although it does have some above-average pieces, like Silent Snow, March of the Brave, March to Rebirth and Last of the Blood. Rather, I find it interesting because the style is so much like my own. So much of the material reminds me of bits from the hours and hours of improvisational recordings I’ve made over the years. It probably hasn’t escaped anyone that my musical development has been inspired primarily by Japanese composers (namely Nobuo Uematsu and Yoshinori Shiono). Amongst my contemporaries in the TES modding scene, my music sits on its own in a corner somewhere, quite Soule-like but also unlike what you’d hear in a typical Western RPG. Where we differ is mostly in Tomoki’s use of staccato and certain chordal textures, both of which I’m inclined to think are more pronounced due to the solo piano nature of the score. The performances are by Randy Kerber. Tracks like Silent Snow lead me to think that he’s grown a third arm. My only criticism of his playing is that some of the tracks could use a bit of rubato to offset the near-metronomical playing. I wouldn’t describe I Am Setsuna as memorable as it is overshadowed by its superior inspirations. It filled the space in a video game industry which otherwise doesn’t cater much to me any more. I’ll take what I can get.